On Friday night, my friends Misti and Mike suggested we all go out for dinner and drinks, and Misti chose Babalu in Overton Square. It’d been quite awhile since my last visit there, and they’ve changed the menu a bit. But of course, they still had Tableside Guacamole! I could typically make a dinner from this alone. But I ran nine miles Saturday morning, so I was pretty hangry. I needed a little more than chips and guac. I used to love Babalu’s vegetal tacos, but I was sad to see those are no longer on the menu. 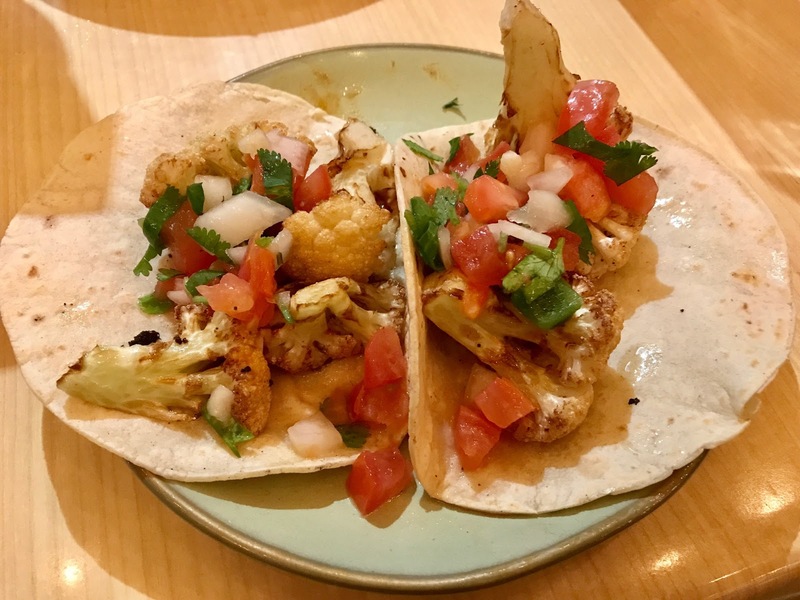 They did have Cauliflower Tacos, which were less vegan friendly (with mayo-based slaw and mayo-based comeback sauce). But the server let me swap out slaw and sauce for pico. They were good, but the old tacos were better. My whole meal was washed down with a Crosstown Brewing Co. Traffic IPA. When my parents came to visit Friday night, my mom brought me a Blueberry Muffin she’d made. It had a crumb topping and made a PERFECT car snack while out running weekend errands. My dad brought me some tofu he’d smoked in his new smoker. I first tried the tofu on a salad with tahini dressing and fried chickpeas. So good! Then I had some in a Smoked Tofu & Veggie Bagel Sandwich with Air-fried Squash. The sandwich (on a whole wheat bagel thin) had avocado, tomato, cucumber, and lettuce, and it hit the spot. The air-fried squash (my dad’s recipe) satisfied my craving for deep-fried squash without the oil. Speaking of the air fryer, I also made some Maple Cinnamon Apple Hand Pies in the air fryer using my mom’s no-fail crust recipe and my apple pie filling recipe. These were flaky and best enjoyed warm with Halo Pancakes & Waffles vegan ice cream!